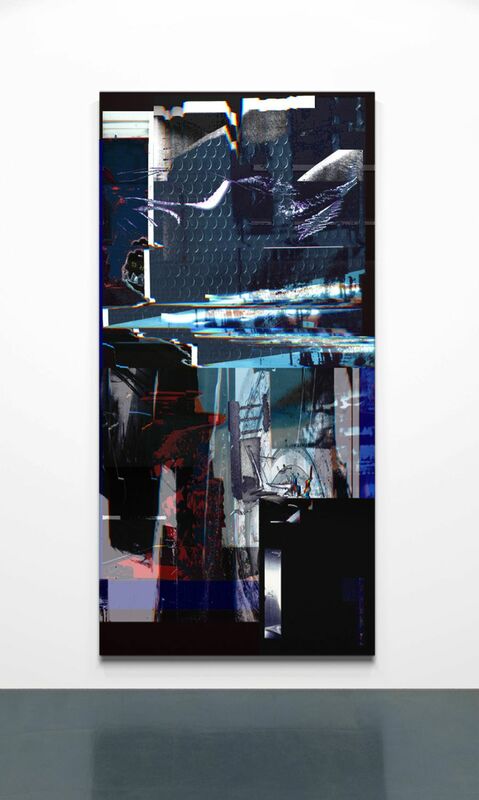 Lyles & King is excited to present Civilian, an immersive installation consisting of 9 new Alumacore panels and 5 video screen works by New York based artist Chris Dorland. Using steel stud partitions as both support and barrier, Dorland has created a futuristic, industrial cage-like installation that enhances and transforms the gallery’s existing architectural qualities. Dorland’s hallucinatory digital distortions and glitches describe a fragmentary world in transition. One where fast paced technological developments have been at the expense of a brutal social and ecological violence that fuels our consumer driven society. Working from an extensive archive of print and digital material that encapsulates the dreams, and failures, of Post-War capitalist culture, Dorland mediates the flow of visual information through various machines and filtering processes’. Describing his studio as both a laboratory and junkyard for outdated and obsolete technology, Dorland characterizes his role as that of a technician, or assistant, to his various machines, as he facilitates the intake and outputting of visual information into strange new images. Stretching, fragmentation, and other failures to properly scan result into a hectic and corrupted machine made language that is as violent and inhumane as it is unnerving and beautiful. Dorland’s hypnotic video work, looped and processed footage taken from commercials, violent first-person shooter games and as well as footage the artist films wandering the city streets at night, likewise contain threatening elements of glitch, randomness and corporatized desire. Though Dorland’s traumatized source images may be indecipherable, the resulting composite images viscerally evoke the palpable unease underlying twenty-first century urban life. The bizarre contradictions of extreme luxury at the corresponding expense of others; such costs, while largely unacknowledged in daily life, contribute to the underlying sense of anxiety that permeates our current moment. Civilian itself refers to the individual within a larger network, whose mode of living is unconsciously guided by an inescapable consumer lifestyle, the mechanics of which have been almost entirely underwritten by developments from within the military-industrial complex. Neither fully abstract or functionally representational, the most revealing of Dorland’s pieces allow us to apprehend the force of invasive technologies as they merge into our bodies and psyches. Dorland’s less forthcoming pieces convey a structure but preclude an understanding of its dynamics. Either outcome of looking, being brought to harsh recognition or to confusion, contributes to a fraught sense of perception and reality. As we move ever closer towards a post-humanist world where our daily interactions will increasingly be mitigated by Artificial Intelligence, the question becomes how will machines affect our core understanding of ourselves. Dorland’s darkly poetic vision captures a view into our totalizing capitalist system as it currently is, and brings to light questions as to what might perhaps be at stake for the future.